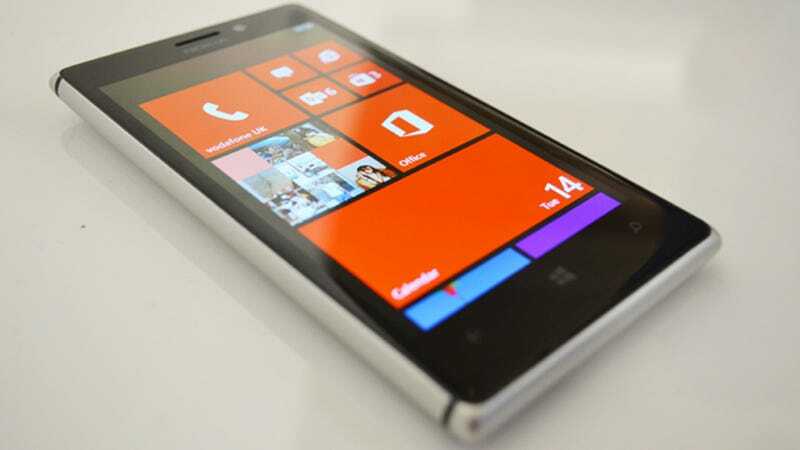 Nokia’s just unveiled the Lumia 925—and it's the Windows phone that you'll want. Gone is the all-plastic traditional Lumia, subsumed by a much more refined feeling metal-polycarbonate mix. This thing looks and feels great. So, what’s it like? Well, if you take the Lumia 920, remove about 20 to 30 per cent of the weight, slap brushed metal sides on it and make it only marginally thicker than a svelte HTC One, you’ve just about got it. The metal band antenna round the outside is punctuated with small black bars at the top and bottom corners, which will hopefully prevent any death grip issues, like the iPhone 4 suffered back in the day. The back is made of your now-standard quality-feeling polycarbonate that you know and love from Nokia, curved to fit the profile of a palm providing some great ergonomics. This thing feels great in the hand, just like the HTC One does with its curved backing. Speaking of the back, turn the thing over and you’ve got the camera module and flash, which are just the same as the Lumia 920 before it, without the extra bulk that its predecessor came packing. On to the front, the screen itself is as vivid as previous Nokia efforts, with colours popping nicely and edges and text as sharp as ever. Windows Phone is, well, Windows Phone, which means it’s about the same as any other high-end WP8 phone. No real lag to speak of, and entering apps was pretty rapid as you’d expect. Nokia’s bigging up the camera stuff, which we’ll go into more detail about later, but for what it’s worth, Nokia’s Smart Cameradoes what it says on the tin. Operating just like HTC’s Zoe, except with a way better name, it’s essentially burst fire with the ability to meld images into the perfect snapshot. Each frame is captured at 5MP, apparently “something others can’t do” according to Nokia. That means you can eliminate people from the picture, or do the fancy thing and have action shots with multiple images of your target of choice flying through the air or something, all combined into an awesome composite image. We’ll be giving the camera a good test, seeing as Nokia’s so proud of the thing, and update with sample shots as and when we can get them. Update: Now we’ve had a chance to have a good play with the camera, including Nokia’s new Smart Camera app, and it looks like the Lumia 925 is a big step up. Nokia’s thrown both nifty, enhanced camera software and a new system of lenses into the Lumia 925, complete with a sixth glass lens in the camera assembly, which is apparently unique to Nokia. Unfortunately, Nokia won’t let us take actual, real sample images from the phone, so we have no idea what they’ll look like once you get ‘em onto a computer and blown-up to full size. Having said that, the Lumia 925′s camera displayed incredibly impressive low-light performance. Stacked up against the current king of low-light photography, the HTC One, it captured much more saturated and vivid images in the dark. It’s difficult to tell how sharp they are without breaking them out on a laptop, but on the phone they really popped. I can certainly say, in admittedly even dark-for-a-club conditions, it annihilated the HTC One. Of course, without testing the thing out in our own lab-style settings, take it as an indication of greatness rather than out-and-out proof. Likewise in really bright light the Lumia 925 performed admirably, handling the challenging contrast conditions well, although the difference between it and the HTC One wasn’t as big this time round. The Smart Camera performed as you’d expect, snapping 10 5MP shots in burst fire and then letting you edit them up, combine them, and make fancy-looking arty shots. In fact, it takes what HTC’s done with the Zoe and adds a few extra features into the mix. The motion focus mode is particularly impressive, creating images where your moving subject is perfectly in focus and sharp, but the background is in motion. It’s a really nice effect, and something that would take you ages if you attempted to recreate it with Photoshop. The beauty is that if you’ve already got a Windows Phone 8 Lumia, you’ll get the Smart Camera app too, so these kinds of cool effects aren’t just limited to the new 925. For a thorough test of the camera, we’ll have to wait till we get this thing in our unwatched-by-Nokia paws, but for now, colour us impressed. The Lumia 925 might just be the best camera phone to date.